Whenever we talk about a new options trading strategy, the first thing I always say is "Practice before you spend any real cash on a live trade." And the second thing I always say is "You should never risk more than 2% of your account on any one trade." That means that for an account with, say, $25,000, you should never risk more than $500 on any one trade. On occasion, though, you may spot a trade that you believe in your heart can make you big money. The only problem is… it costs more than $500. So can you still make a profit without completely ignoring your risk management? We've talked before about risk graphs and how you can use them to "see the future" of two straight directional options trading strategies, long calls and long puts. Today, I want to use a risk graph to show you the risk and profit potential on two of the debit spreads I often like to use during volatile times – the debit call spread (or bull call spread) and the debit put spread (or bear put spread). 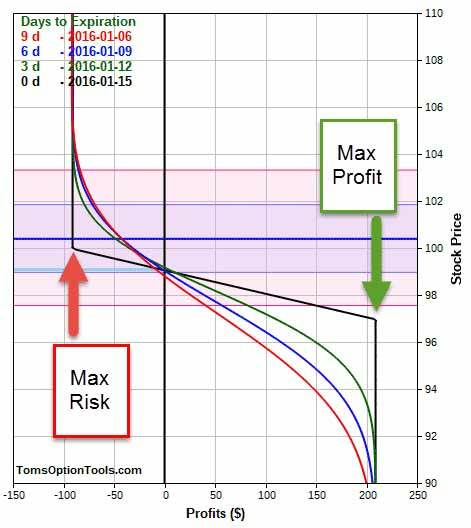 Remember, a risk graph will show you the theoretical profit potential you have when trading long calls and long puts. Keep in mind that your profit potential is unlimited when buying calls, but your maximum profit potential when buying puts is limited since the stock can only drop as low as zero. The most you can risk (or lose) on a long call is the amount of money you spent getting into the trade. The most you can risk on a long put is the same – the amount of money you spent on the trade. With a debit call or debit put spread, what you're really doing is "selling to open" an option against the one you "bought to open" to hedge the risk of your trade. This means that you're simultaneously buying and selling either calls or puts (on the same order ticket) to offset the cost of the calls or puts you bought. Now, as I mentioned above, the best way to manage your risk is by making sure that you never risk any more than 2% of your account on any one trade. That's a maximum risk of $500 per a $25,000 account. But if you want to make money off an option that costs more than $500, the best way to do it is by creating a debit call spread or debit put spread. Well, you can buy to open that option priced higher than $500 ($5.00) and sell to open the same number of contracts for another option that has a different strike price but the same expiration month as the option you bought to open. By selling to open this other option, you bring some money back to your account. Now, this is all part of the same trade… These two options are to be opened at the same time on the same order ticket. I recommend consulting your broker to find out the commissions for this type of trade. You generally want to close these two options at the same time. To do this, you simply reverse your orders: Sell to close the option you bought to open and buy to close the option you sold to open. Again, you'll want to enter these orders simultaneously on the same ticket. I've nicknamed these two trading strategies – debit call spread and debit put spread – the "loophole" and "reverse loophole" trade. Loophole in this context means you offset your cost by looping some money back to your account through selling to open an option against the one you bought to open. On this order, you buy to open the $125 calls while simultaneously selling to open the $130 calls. This creates a vertical spread with a limit price of $2.75 (or $275), which results in a debit to your account of $275. Remember, you can look at any time interval (represented by the four colored lines) on the risk graph. With these debit spreads, I like to focus on the maximum loss and maximum profit price points on the graph. Now the stock has to be at least $0.01 above the strike price for the option you sold debit call spread in order for you to realize your maximum profit. Keep in mind that the market has the right to call away (or buy) the stock from you at $130, whereas you have the right to buy the stock for $125. Your broker should know this to make sure that actually happens. That $500 ($5) is offset by the $275 ($2.75) cost, leaving you with a profit of $225 ($2.25). Your maximum reward is represented at expiration by the black line on the risk graph. You can tell where that price is when the black line goes up vertically. This shows that no matter how much higher in price LNKD goes, your maximum profit can't get any higher than that $225 profit. Your maximum risk is the total cost of the trade, which is $275. This is represented on the risk graph by the black line. You can tell where that price is when the black line goes down vertically. And no matter how much lower LNKD goes beyond $125, your risk is capped at $275. On this order, you buy to open the $215 puts while simultaneously selling to open the $205 puts. This creates a vertical put spread with a limit price of $5.17 (or $517), which results in a debit to your account of $517. Now you can ask for a debit of whatever you like, within reason. So if you want a debit of $5.20 or $5.15, you can certainly ask your broker for it. As I mentioned, this is a $10-wide spread, and I tend to look for a wider spread of 10 points on stocks that are in the upper $100 to $200 price range – usually closer to $200 is more likely. The reason I recommend looking for this type of spread is that stocks in the $200 price range easily move five points or more – so you're able to find trades with an increased probability of making you money. The stock has to be at least $0.01 below the strike price of the option you sold for a debit put spread in order for you to realize your maximum profit. The market has the right to put the stock to you (or sell you the stock) at $205, whereas you have the right to sell the stock for $215 (and your broker should know this and make sure it actually happens). This $1,000 (or $10) is offset by the $517 ($5.17) cost, leaving you with a profit of $483. Your maximum reward is represented at expiration by the black line on the risk graph. You can tell where that price is when the black line goes down vertically. 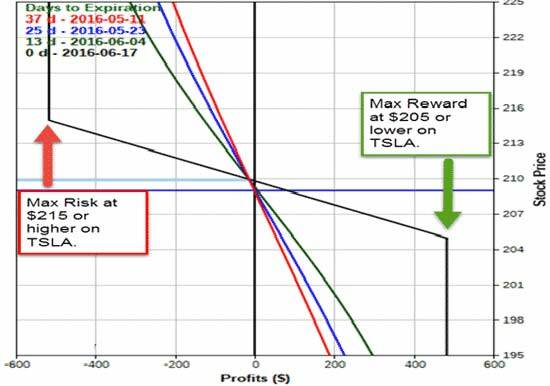 And no matter how much lower TSLA goes, your maximum profit is capped at $483. Your maximum risk is the total cost of the trade, which is $517. This is represented on the risk graph by the black line. You can tell where that price is when the black line goes up vertically. And no matter how much higher TSLA goes in price above $215, you can't lose more than the original $517 you spent to get in the trade – even though this amount exceeds your maximum risk of 2%. You can offset the costs of your options trades even further with a credit spread. Credit spreads work precisely the same way as debit spreads, with the exception that the option you buy has a lower value than the one you sell, resulting in a net credit to your account. Now, that credit isn't yours until the trade has been completely closed, and this trade doesn't completely absolve you from risk, but it's a perfect strategy to hedge your risk when you expect a stock to make a more moderate move. A bull put spread is a "put credit spread" where you set the trade up for a credit to your account. And if all goes well, it will be released upon expiration when the options expire worthless. In a bull put spread, you would typically buy a put option and then sell the next higher strike price option. Below is an example of buying a $40 put option and selling a $45 put option at the same month's expiration. The purchase at the lower strike price and the sale at the next strike higher price at the same time and as one order. The resulting credit amount on a per-contract basis as a result. 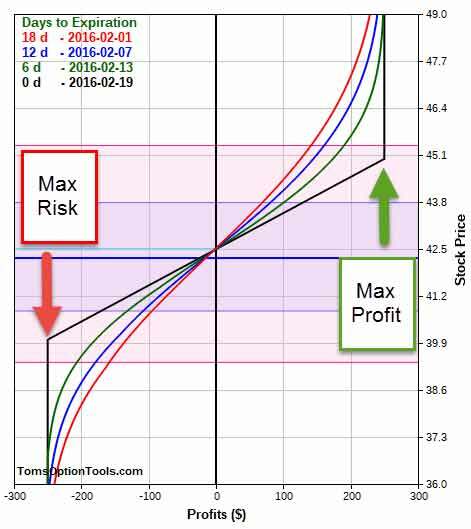 The maximum profit and risk potential on the trade. There is much more profit potential on a long call, but that would incur a cost, whereas the bull put spread generates a credit to the account. As long as the stock gets above (and stays above) $45, maximum profitability would be achieved. And even though you might miss out on the possibility of unlimited reward for a long call, the probability of the stock reaching that maximum profitability point is higher in a bull put spread option. In this scenario, the stock only needs to get above $45 for this option trade to pay out. 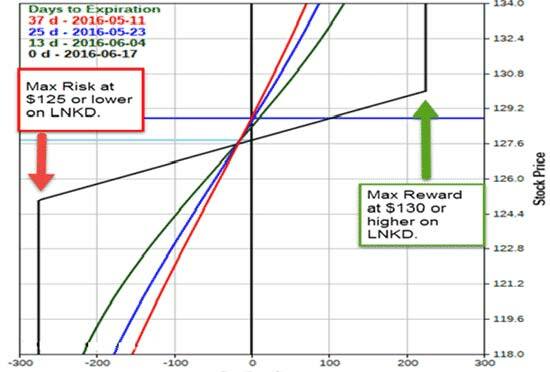 The risk graph below illustrates the maximum risk and maximum reward potential of this trade. Anywhere above the $45 stock price gives you a maximum reward of $2.50. The reason being… if the stock is greater than $45 at expiration, would anyone in the markets sell it to you for LESS than the current market price of over $45? And in that case, would you have the necessity to force someone to buy the stock at $40? In this case, both options expire worthless, and no transaction takes place, so there is no transaction cost or fees – and you get to keep the full credit of $2.50. Since your risk was technically $2.50, your making $2.50 on it gives you a double. A bear call spread is a "call credit spread" where you sell a call at a certain strike price and buy another call at a higher strike price. The number of contracts for each and the expiration month should be the same for this type of spread. Rather than using a bearish loophole strategy, the bear call spread will pay out its maximum reward at expiration without a transaction cost – as long as the stock ends up where it should. Below is an example of selling a $97 call and buying a $100 call, creating a $3 call credit spread. The sale of the lower strike call and the purchase of the next higher strike call at the same time and as one order. The credit amount on a per-contract basis as a result. A long put option may pay out more due to the fact that the stock has the opportunity to drop all the way down to zero. But, by minimizing the risk of buying options and creating a spread, you still – as you can see in this case- have the chance for a healthy return on investment (ROI) percentage. The risk graph below illustrates the maximum risk and reward potential of this trade. You face your maximum risk if the transaction gets executed when the stock is anywhere above $100 at expiration. If the stock gets sold at, say, $97, and you have to buy it at $100, the difference in the strike prices – $3 – is your loss. You offset that $3 loss with the credit of $2.09 that's generated to open the position. Therefore, your maximum risk amount is $91 (all on a per-contract basis). Anywhere below $95 at expiration gives you the maximum reward of $209 because if the stock is below $97, who would want to exercise the right to buy it from you at the higher price of $97? Therefore, you do not have to exercise your right to buy the stock at $100 in order to replace at it $97. Both options expire, and you keep the premium you sold to open the trade. There are many similarities between the bull put spread and its mirror image, the bear call spread. In either strategy, you need the stock to be trading out of the money at expiration to maximize your reward potential. But while the bull put spread needs prices to move slightly higher, the bear call spread only needs prices to slightly drop. And in today's market conditions, this makes it a powerful contender. As you know, stocks can move in three directions only: up, down, or sideways. 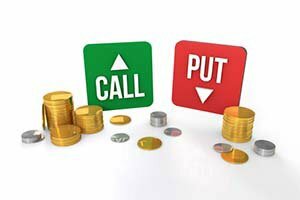 With a long call or long put, the stock HAS move in the anticipated direction (up for calls and down for puts) for you to make money. This gives you basically a one-in-three chance for profitability. But when it comes to a call or put spread, the stock can move in the direction you need it to or stay right where it is… and profitability can be achieved. Remember, the more risk, the more reward… just as the less risk, the less reward. A call or put spread is a way to minimize your risk, which decreases your profit potential. However… a higher probability might be worth this trade-off to you too – especially on an expensive option. Tom Gentile sold his first trading breakthrough for tens of millions of dollars. He thinks his next breakthrough – Alpha-9 – could be worth 10 times that. This time, he's not selling it to Wall Street. Instead, he wants to show you how it can make you a millionaire by this time next year.